I’m not quite sure how it came so fast – but it did. The holiday season. I’ve managed to get all my shopping done but not a single present wrapped. I’m currently hurtling half-way across the country 10,000 feet in the air and furiously trying to get this recipe post together before I can say it’s officially the holidays. (Isn’t technology AMAZING?!) I’ve got no work planned, no recipe testing, no email checking – just good ol’ fashioned relaxation. I’ve downloaded three new books, busted out my dusty Kindle, and I’m ready to take on (or more likely hide from) the cold. Madison is in a little carrier under the seat in front of me, looking dapper as she snoozes with her Christmas bow on. Isn’t there something inherently nice about the holidays? People go out of their way for each other; I saw three people offer up their seats in the boarding area to women with small children. Yesterday, when I went to pick up two new prescriptions and one of them was way too expensive and I turned it down – after I checked out the clerk dropped it in my bag and said “your Christmas present is in here too.” I was shocked and oh so delighted. One of the many ways we show each other we care this time of year is through food. My mom has been plotting and planning for weeks about who would bring what to Christmas day, what she is going to feed me – or what from my recipes she wants me to make. A couple weeks ago I wanted to give my oh so popular 4th of July mini cheesecakes a different holiday spin. 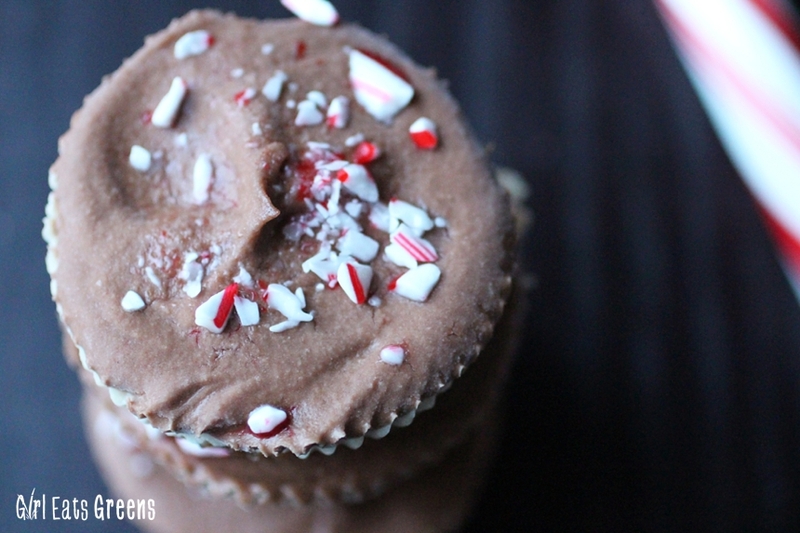 This time, I decided to add some of my favorite holiday flavors; peppermint and chocolate. What I love about this recipe is that it requires absolutely no actual baking or cooking. 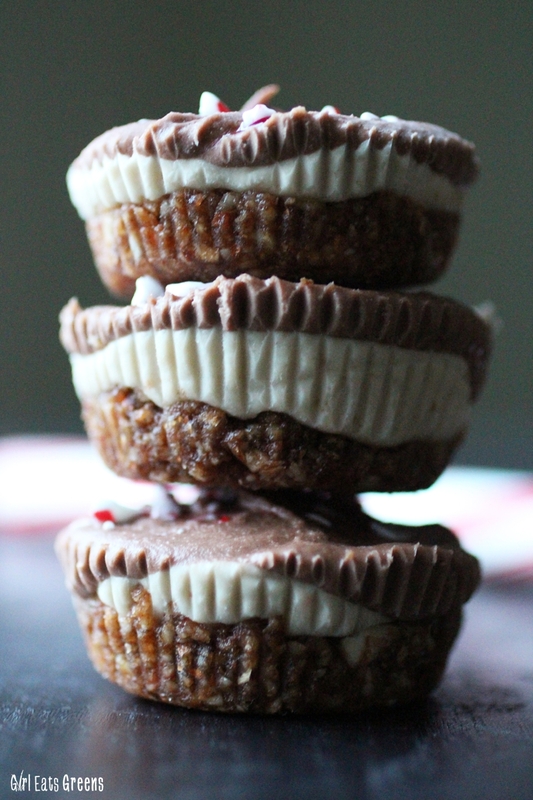 It’s really just you and a food processor and you’re making awesome desserts in no time. I made the crust out of almonds and dates so they’re also gluten-free, and I added a touch of coco powder to give them a slight chocolatey hint as well. I’ve found this crust so easy to work with and also pretty darn delicious – and I have plans to see how many other raw vegan gluten-free desserts I can come up with to use it for. For the “cheesecake” part of things I went with cashews soaked until they were soft, added a bit of agave syrup, coconut milk and coconut oil. I have some peppermint extract rolling around in my cupboard and it was the perfect addition to the cheesecake to give it a minty flavor. It’s mild, and not overpowering, but just enough to make you feel like you’ve licked a candy cane. In a good way. For half the batch I went as-is, just plain vanilla and mint. But for the second half of the batch I added cocoa powder to give it a rich chocolatey flavor. I wanted to try and do something fancy and try to swirl the two colors together but I wasn’t quite successful. 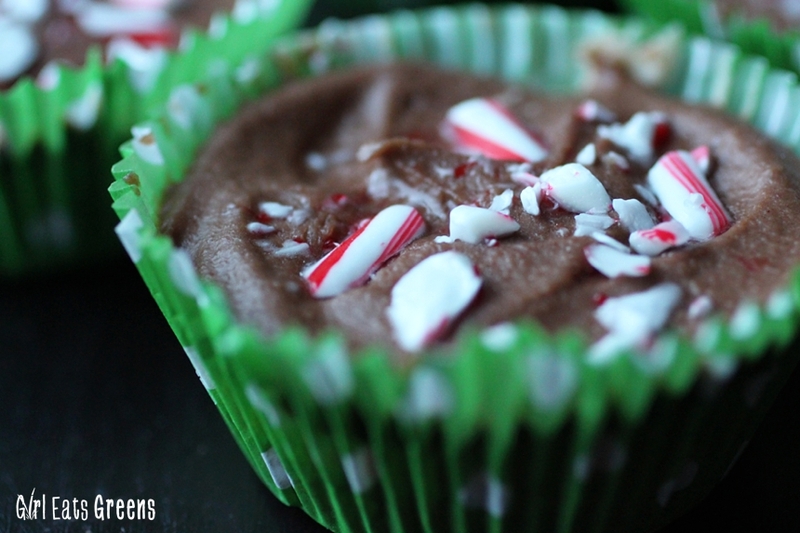 I just topped the peppermint with the chocolate filling – which ended up giving the cheesecakes a really great layered effect once they’re out of the wrappers. If you haven’t worked with coconut oil before, it’s pretty cool. It’s normally solid at room temperature (depending on how high your heat is on) but once it’s melted down, mixed in, and then cooled – it helps keep the cashews and coconut milk solid and creamy. But because of this, the cheesecakes need to be placed in the freezer before you can serve them so they set. But after that, it’s up to you. For a more traditional cheesecake consistency you can keep them in the fridge. I like to keep them frozen and then let them thaw just a little bit before eating – giving it an almost ice cream cake appeal. Either way, they’re pretty darn delicious. Just don’t leave them out at room temperature too long (ie not potluck/buffet style) or they’ll get a little melty. 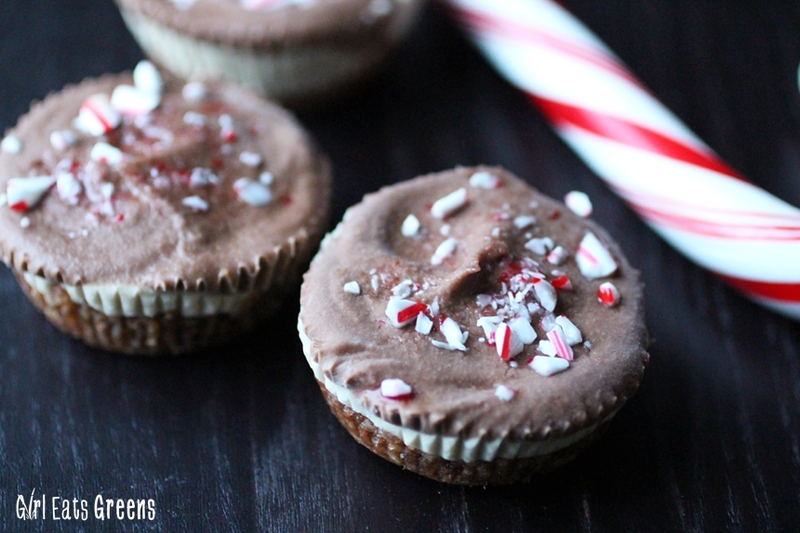 I topped each of the cakes with a little crushed candy cane, mostly for festive and decorative purposes, so if you want to keep this recipe refined-sugar free, you can definitely omit them. Aside from being festive, the convenience of an individual size dessert allows you to share easily (and not just eat the whole cake yourself). Pack them in a tupperware and take them to your holiday get together – or give them out to a stranger and make someone’s day. It’s the holidays, after all, and if you can’t make the day a little sweeter for someone else, what’s the point? I wish you all a happy and healthy holiday and a wonderful new year. See you in 2015! Start by making the crust. 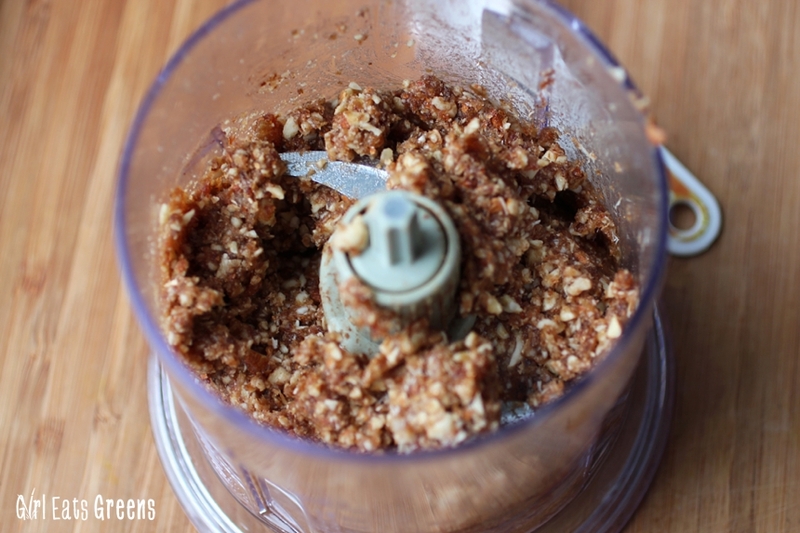 Add all the ingredients to your food processor and pulse until the almonds are pretty broken up and the dates are getting pretty sticky. 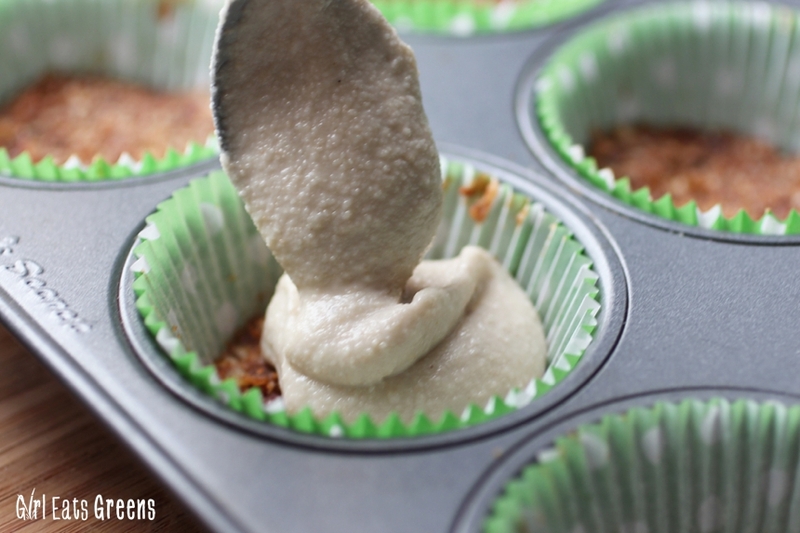 Press the crust into cupcake tins lined with paper cupcake cups. If you’re using the same food processor for the insides, take a moment to rinse out the inside. 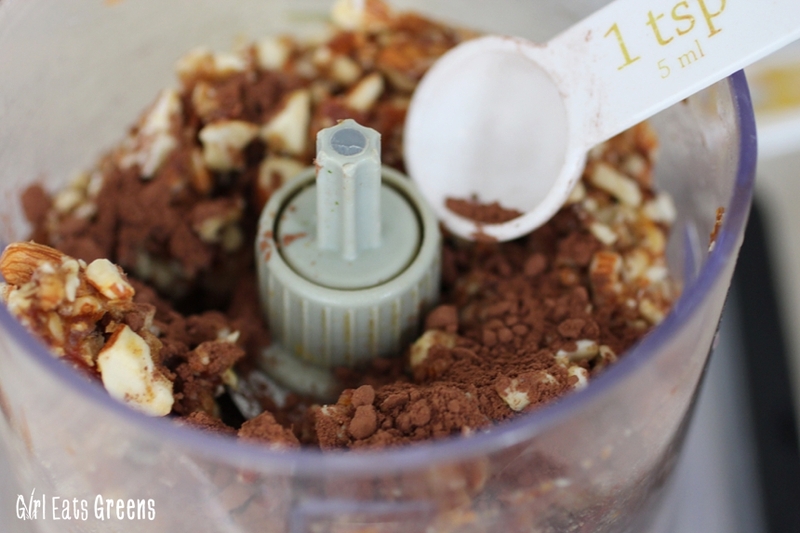 Add all of the filling ingredients EXCEPT for the cocoa powder, teaspoon of agave, and water to the food processor and blend until smooth. Using a spoon or spatula, place half the filling mixture evenly among the cake tins. Add the cocoa powder, water and agave and blend again. Adding the cocoa powder made the filling taste a little less sweet to me, so I added extra agave – but it’s optional. Add the remaining chocolate filling to the top of all the cheesecakes – about 3/4 of the way to the top of the liners. 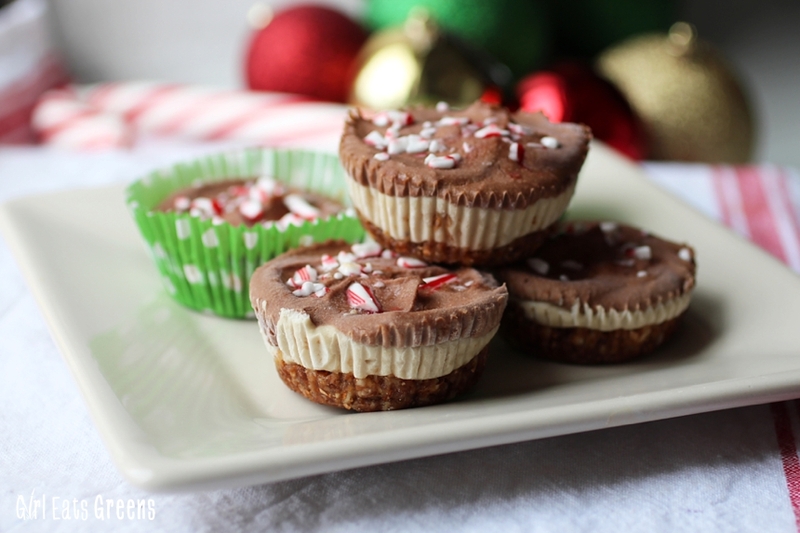 Crush a small candy cane and sprinkle the remnants on top of the cheesecakes. Freeze for at least 2 hours, or until cakes are firm. Let thaw a couple minutes and enjoy! These look amazing! What a fun combination and presentation! Yum. My mouth is watering, these look great! So simple too!